In an embarrassment to the Reserve Bank, a British entity calling itself City Savings Bank has set up in New Zealand aiming to use this country's good reputation to raise money overseas and is claiming to be regulated under the Reserve Bank of New Zealand Act when it is not. Interest.co.nz was alerted to City Savings Bank by a British journalist wanting to know why the entity didn't feature on interest.co.nz's deposit rate comparison pages and asking whether it was a bona fide bank or not. 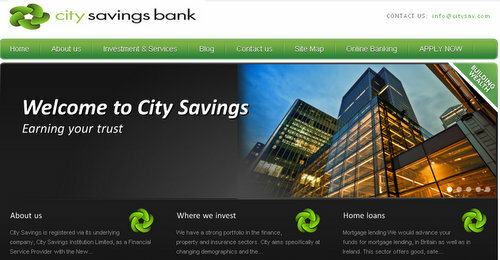 City Savings Bank does have its rates listed on British website money.co.uk. City Savings Bank's website lists its headquarters as Level 4, 228 Queens (sic) Street, Auckland Central. It says the "bank" is authorised to offer "banking services" such as deposit taking, savings accounts, debit and credit card services, commercial and private lending, and foreign currency transactions. Using the phrase "let us earn your trust and then earn you high returns," City Savings Bank says its activities are regulated by a swathe of acts including the Reserve Bank of New Zealand Act 1989, the Companies Act 1993, the Consumer Guarantees Act 1993, the Credit Contracts & Consumer Finance Act 2003, the Securities Act 1978, and the Proceeds of Crime Act 1991. The website also notes that New Zealand - "home of City Savings" is perceived as the least corrupt country on the planet, and links to Transparency International's Corruption Perceptions 2011 Index which ranks New Zealand as least corrupt. Although calling itself a bank, City Savings Bank doesn't appear either on the Reserve Bank's list of registered New Zealand banks nor on its list of current and former New Zealand banks. A Reserve Bank spokeswoman told interest.co.nz the central bank hadn't been aware of City Savings Bank, which she confirmed wasn't a registered bank, but would now "make enquiries." The spokeswoman said "the entity" appeared to include characteristics typical of an offshore finance company, which the Reserve Bank does not regulate. She also pointed interest.co.nz to a section of the Reserve Bank's website that notes New Zealand law does not provide for any form of officially sanctioned offshore finance industry. "In particular, there is no provision for the licensing or supervision of any form of offshore financial institutions that are incorporated in New Zealand but provide financial services only outside of New Zealand," the Reserve Bank says. "Licensed banks are the only type of financial institution that are permitted to call themselves banks." Interest.co.nz popped into City Savings Bank's headquarters at Queen Street's H.B. Building - sandwiched between Burger King and Farmers - and found general manager Simon Virgo in a small office. He described City Savings Bank as a bank "with a small b." Virgo said it had set up in New Zealand (largely due to this country's good name and for an advantageous tax position it could derive from doing so) about six weeks ago. He said City Savings Bank wasn't offering services to New Zealand residents, but eventually hoped to, and said the entity wasn't a front with nothing behind it as it has backing from "a real company" in Britain. Virgo also asked for interest.co.nz not to publish City Savings Bank's deposit rates on its website as "that might get us in trouble." In the small print at the bottom of its website City Savings Bank acknowledges it's not a registered bank. However, it says it's authorised by the New Zealand government to take deposits and "offer a full range of banking services." The Reserve Bank Act outlines that the Reserve Bank can act against an individual or entity that's claiming to be a banker or New Zealand registered bank when they aren't. Potential penalties for an individual, if convicted, include up to 12 months jail and a NZ$100,000 fine and a NZ$1 million fine for a body corporate. City Savings is registered through what its website calls its underlying company City Savings Institution Ltd, as a financial service provider with the New Zealand Companies Register, run by the Ministry of Economic Development. It's registered to offer deposit taking services, wholesale and/or generic financial adviser services, to provide credit under a credit contract, to operate a money or a value transfer service, to give financial guarantees and to change foreign currency. The Companies Office lists the London-based City Corporation Ltd as City Savings Institution Ltd's sole shareholder, with the latter incorporated in New Zealand on November 7 last year. Meanwhile, City Savings Bank's website offers 4% interest on six month deposits, 6% for nine months and 8% for 12 months, saying it takes minimum deposits of £25,000 (about NZ$48,000) "or equivalent in currency." Among other things its website says it funds "safe and profitable" European real estate development, and would advance "your funds" for mortgage lending, in Britain as well as Ireland. It says the mortgage lending sector offers good, safe returns and a regular flow of capital which is ideal for depositors, noting elsewhere on the website that "we help young and disadvantaged borrowers onto the home owning ladder." The website lists City Savings Bank's board as British-based chairman Richard Ashken, who is described as a Financial Services Authority approved/authorised person, Swiss-based director Anthony Travis, a former senior partner at PricewaterhouseCoopers in Geneva whose clients included the Bank for International Settlements, and Swiss-based Stefan Ritter, who it says has worked in Proctor and Gamble's treasury department. Also listed is Virgo, who prior to joining City Savings, ran his own British business providing industrial services to FTSE250 clients, according to the website, and has also worked for Dresdner Kleinwort Wasserstein and Accenture, formerly the business and technology consulting division of disgraced accounting firm Arthur Andersen. Last September a Reserve Bank spokeswoman told interest.co.nz the Reserve Bank had prevented "many" frauds occurring overseas through the financial activities of New Zealand registered companies and, with Companies Office assistance, the Reserve Bank had got a "significant" number of companies expunged from the Companies Register. The Reserve Bank spokeswoman's comments were made to interest.co.nz when we asked for further detail after then-Commerce Minister Simon Power noted Reserve Bank concerns about New Zealand registered companies committing financial sector crimes overseas in a cabinet paper. Power, now head of Westpac NZ's private bank, had said 143 New Zealand registered companies were implicated, over a four year period, in criminal activities overseas such as smuggling, money laundering and tax fraud with New Zealand Police and the Customs Service receiving 134 enquiries about them. He said the Reserve Bank believed about 1,000 shell companies incorporated in New Zealand over three years had been used to carry out banking activities free of regulatory oversight and "many" seemed to be undertaking fraudulent activities. Power introduced the Companies and Limited Partnerships Amendment Bill to Parliament on October 13 last year. He said it would tighten rules around company directors and company registration in a move designed to protect New Zealand's reputation as one of the best and most trusted places in the world to do business given this reputation was threatened by overseas interests using New Zealand-registered shell companies to undertake criminal activity. See the full bill here. A spokeswoman for new Commerce Minister Craig Foss said the Bill is still awaiting its first reading. Once it has had the first reading, the Bill will be referred to a select committee, with the select committee process likely to take about six months. The government says the Bill will give new powers to the Registrar of Companies to investigate and deal with non-compliance with the Companies Act including the power to "flag" companies on the register that are under investigation. The Registrar will also be able to ban directors of such companies from taking part in the management of any company for up to five years. Similar changes to the Limited Partnerships Act are also proposed, so that those misusing New Zealand companies cannot avoid the new regime by registering limited partnerships instead. Warned twice in the last year the Corleone Family were seriously investigating moving their operations to to NZ because the (lax) regulatory environment was SO conducive to their needs. Last post advised the Kimble Dotcom fiasco caused them to postpone the move until the heat died down. Now this. Bugger. Keep the noise up on this Iconoclast, it looks like NZ is a nice little backwater in which to launder money. Well done, Bernard, and everyone at interest.co.nz for breaking the story! A Mr Simon Virgo, huh? Is Virgo a real surname? I mean was Dr Aquarius and Mrs Sagittarius there too? Yeah...me too Bernard....not sure if you will get a cuppa at the NEXT RBNZ fluff meeting though! It's not common, but Virgo certainly is a surname in use in the UK; there's a well-known snooker commentator and former player called John Virgo. So what is it exactly that these people are doing that's wrong? It's definitely a bit sharp to have the name "bank" in the name when they're not a bank, but they are not claiming to be a registered bank, in fact they specifically state that they are not. They are claiming to be registered in NZ to provide certain financial services - and they are. They are claiming to be backed by a UK company - and they are. The article says they don't have RBNZ approval, but also makes it clear that RBNZ approval is not required for the activities they are carrying out. What exactly is the problem supposed to be? Thats what happens when you create a bunch of litte beraucratic empires, I mean how many acronyms have been mentioned, FSP register, SFO, FMA, RBNZ, Securities Act and they all look like possums caught in the headlights. Typical of the committee mentality, set up a register get everyone to register, but don't police it proactively. You have to admire these guys, quite correctly they are registered financial service providers, and they are a registered company under the companies Act. They just don't do any business here. No law against that, just shouldn't have used the word bank in NZ. By allowing them to register a company and as a financial service provider you are adding legitimacy where there is none. Is this any different to overseas companies selling securities in NZ without a prospectus? [Still] Bernard for RBNZ Govenor..."Cleaning up NZ...One bank at a time"
Maybe Winnie the pooh might be of use to stir this up. 8%.... how do I open an account....? sign me up!! 8% is possible here in NZ by creating a joint first charge mortgage with a local and well established finance company.